There's nothing quite so compelling of excellence from humanity than impending doom. From followers of Rapture theology, it breeds a love/hate relationship with apocalypse. To corporate takeover specialists, it provides an effective tool to keep newly-acquired managers delivering profits for the new big brother. What else can you do, given the knowledge that if you screw up, you're screwed? A little over a year ago, Chuck was in a very different place than now. Home network NBC looked not quite the disasterpiece it was to be shortly, exposed and exacerbated by the Leno debacle. Chuck was a bubble show, and not in the sense die-hard fans describe clearly doomed series, nor that of the jaded followers of network TV who assume only American Idol et al will be spared by the axemen year over year. We were, for once, not quite sure whether it was in NBC's best interests to renew the series; nor, it seemed, was NBC. The results were more than pleasing for fans of quality network TV. Season 2 was an astonishing improvement over the lackluster first season, with a slew of instantly rewatchable episodes, a titillating arc that still managed not to suppress the fun elements that make Chuck unique, and a grand finale befitting such a title. Season 3 exhibits the beginnings of the structural failings of any show that pits an underdog character against increasingly powerful foes. Chuck (Zachary Levi, Less Than Perfect) must forever acquire further skills in the spy field in order to believably defeat great enemies that seem to arrange themselves before him in ascending order of threat level. As he does, he cannibalizes the world around him that lends so much charm to his tale. By the end of this season, there is nothing left here that hasn't been seriously affected, with mostly disastrous results, by the crusade through which Chuck is forced onwards and upwards. Paradoxically, the writers show a curious distaste for exploring the more interesting outgrowths of Chuck's actions. Opposite the pivotal moment of the season, they executed a backpedal so egregious it reminds one of the reversal stunts on Dallas. Given that everyone involved with production clearly knows what they're doing, something or things must have happened. It's possible that the show has peaked a couple seasons early in the usual rise and fall of multi-year series. Perhaps they don't have the energy to pull off another season 2. Or, perhaps, with NBC's dire straits substituting for their own, they no longer drive incessantly forward, seeking new heights with secure ground from which to take shelter from the Reaper, always close behind. All that said, it's still better than most things on TV. As such, I give it a better-than-average grade. Nevertheless, you might feel it's better to cut your losses now, and swallow the irony of losing faith just as it seems to have truly paid off. As with previous seasons each disc contains "declassified information" such as extended or deleted scenes. The fourth disc also contains a "21 making of featurette", A Jeffster rockumentary, and a gag reel. 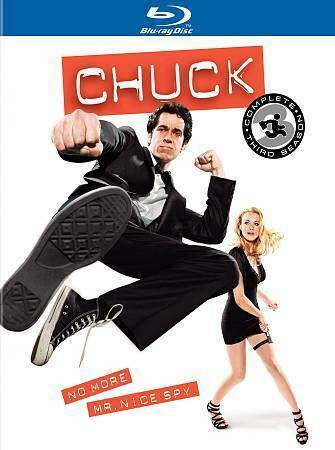 Download Chuck: The Complete Third Season from the iTunes Store in Digial HD. For more information about Chuck visit the FlickDirect Movie Database.